There are several ways in which we can get to the Manage Process Lists dialog box. The easiest is to start from the View menu. 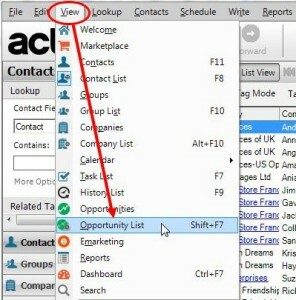 Click the View menu and select Opportunity List to bring up the Opportunity List View. Click Opportunities on the main menu and click Manage Process List. This will bring up the Manage Process List dialog box. 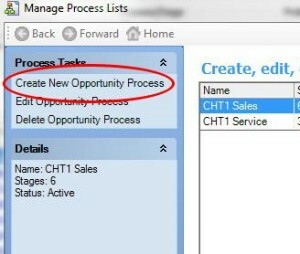 To create a new process, click Create New Opportunity Process. 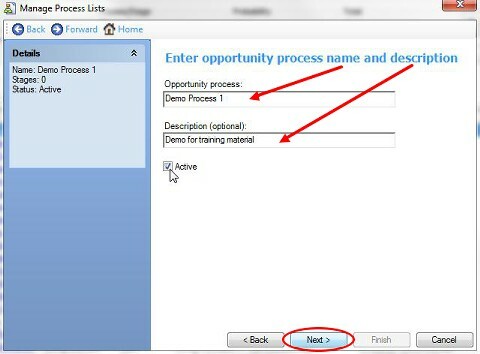 The Manage Process lists dialog box will move to page 2, the Enter opportunity process name and description screen. Enter the name of the Opportunity process, and a description if needed. The Active tick box is used if we are making changes to an existing Opportunity. Click Next. This will bring up page 3 of the Manage Process List dialog box, Customise Stages for New Process. Customise stages for New Process will show the name we entered in the previous step. 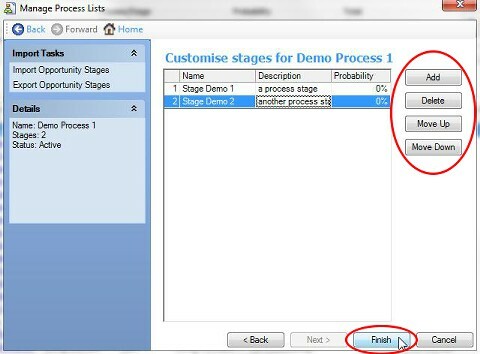 (In my example, it reads Customise Stages for Demo Process 1.) We can now add each stage by clicking the Add button and entering a Name, Description and Probability. We can move the stages up and down in the list by using the Move Up and Move Down buttons. When we have finished adding the stages, click the Finish button. The original Process dialog box will appear, listing all our new sales processes. Click Close to shut the process dialog box. Our new process will now be available within the Opportunity Screen. From within the Manage Processes List dialogue box, click Edit Opportunity Process. Alternatively, we can just double click the process we want to edit. 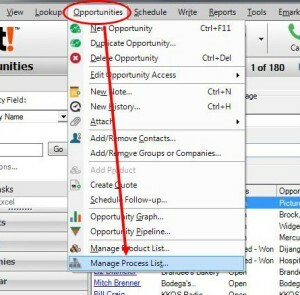 The Manage Process Lists dialogue box will ask for the opportunity process name and description. Make the changes you want and click Next. Customise the stages as required, then click Finish to close the dialogue box and save your changes. How do I grant permission to my salesman to edit the process list?